Many of us use vehicles every day of our lives. Perhaps it is to get to school or work, or maybe there is something you need from the store? They can make a significant impact on our lives, and cause a lot of disruption when they go wrong. Who made them so complicated to repair, anyway? Cars have been a part of our lives since way back in 1886 when the first commercially produced vehicle hit our streets. Since then, vehicles have taken over the world. Not only are there more than one billion vehicles in the world, but there are more in Los Angeles than there are people. How can they be taking over like this? When our cars go wrong, we can be in for a hefty bill and lots of missed appointments. Sometimes we just need to give the repairs a go. What is the worst that could happen? These car hackers were about to find out the precise answer to that question. Thankfully, the people of the internet couldn’t wait to share their finds with the rest of the world. Perhaps we should try and show them how these car hacks really should be done? Hand trucks are great for moving all kinds of things. From washing machines to heavy boxes and everything in between, they have their uses in almost every home. So what happens when your tire works against you, and it’s your car that needs to be moved? There is no need to fork out on an expensive replacement that’s for sure. 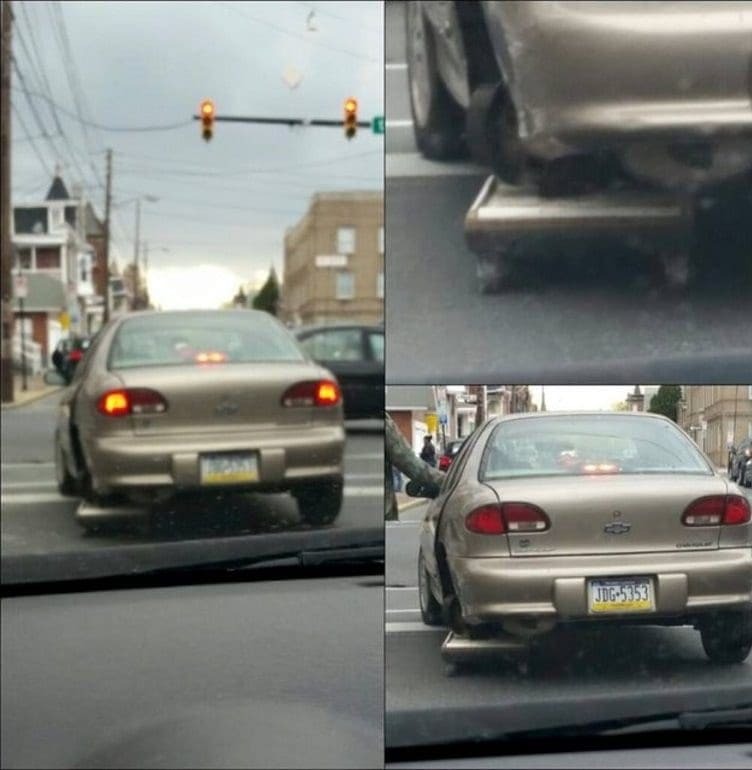 No, now you can use your hand truck to get you back on the road. What else are they for? We are amazed to see it take the weight of the car, and think we all need to shop wherever this one came from. If that’s not reliable, then we’re not sure what is anymore. We’re pretty sure at this point that we are looking more at tape than we are a car. This person is just lucky they opted for a silver vehicle – what would they have done if they had a different paint job? We’re not quite sure how they managed to remove an entire door, but no one can be seen driving around with a giant hole in their vehicle. 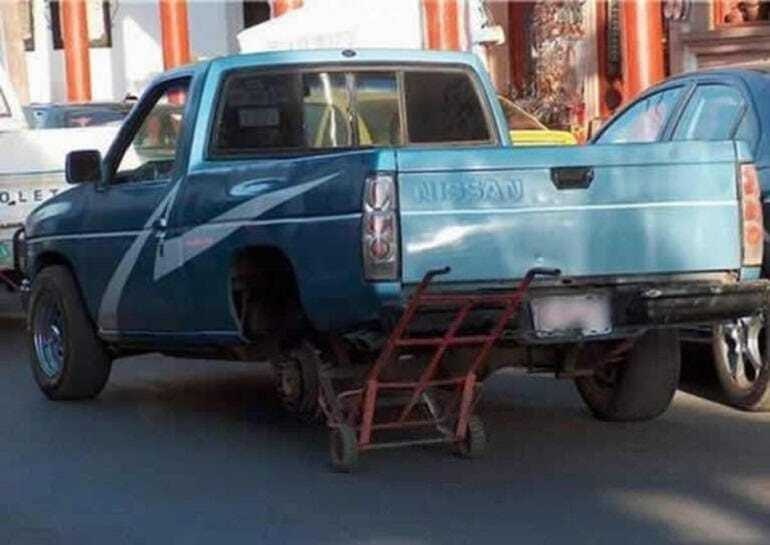 Instead, this car owner was forced to think on their feet to come up with a replacement. 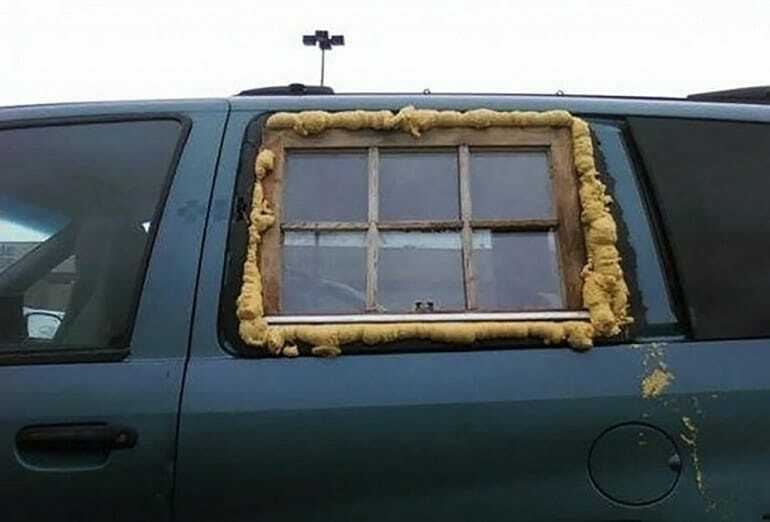 We’re loving the fact they even went to the effort of adding in windows to their replacement door. It’s the smaller details that make it count. Headlights are vital to most cars, especially if you want to take your four wheels out after dark. Unfortunately, like most other parts of a vehicle, they can often go wrong. It looks as though this car has been in an accident that has seen the headlight become a thing of the past. Have no fear; the owner of the vehicle has an idea. Flashlights are perfect for lighting up your path, right? So why not use them as a replacement? Of course, only if you ram three in the once-complete headlight. Sometimes, you just have to be confident enough to roll with what you’ve got, no matter what the haters have to say. 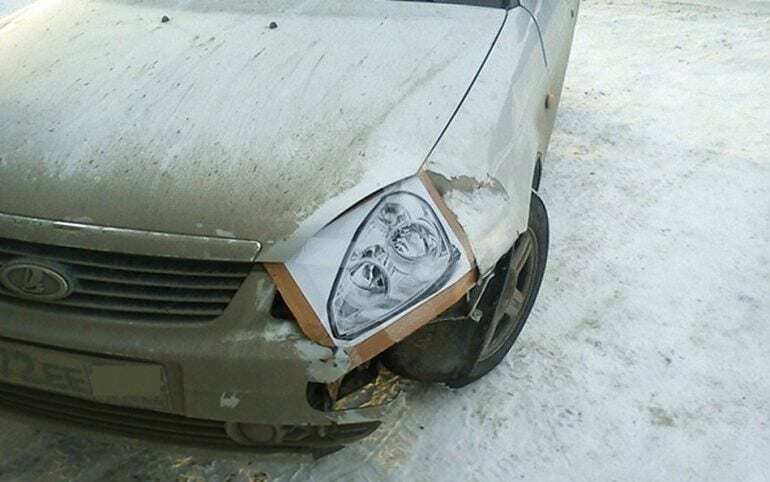 Yes, printing out a picture of a headlight and taping it onto your car might sound crazy to some, but what do you care? You’re in charge here. Plus, if you get pulled over by the police, then no one can say you didn’t try. Although, they probably could, and it’s probably best to actually get it replaced instead. Many of us take pride in our cars. Some may even aim to get the best that money can buy. However, they can be expensive, especially when something breaks. So why would you want to fork out on another badge just because yours broke off? Only, it looks strange not to have one at all. 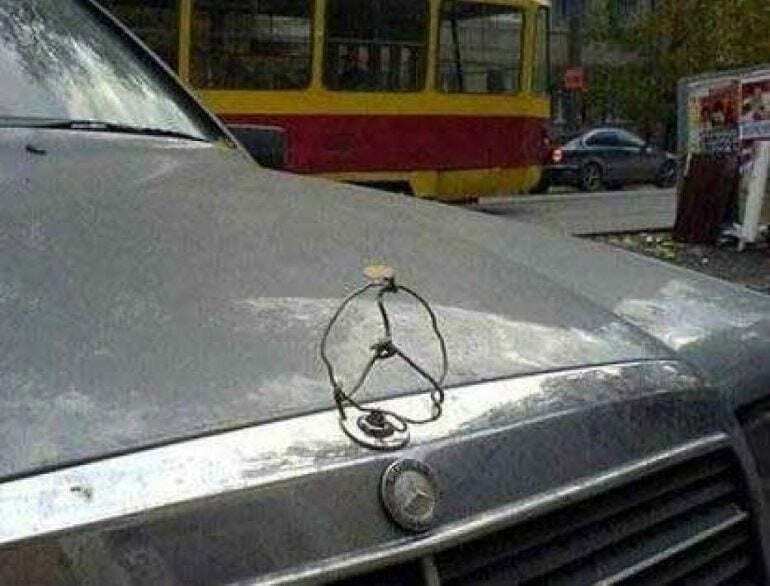 This car hacker took it upon themselves to solve both their issues by merely bending their own Mercedes badge out of old wire. Better hope they’re driving fast enough that no one will ever see. 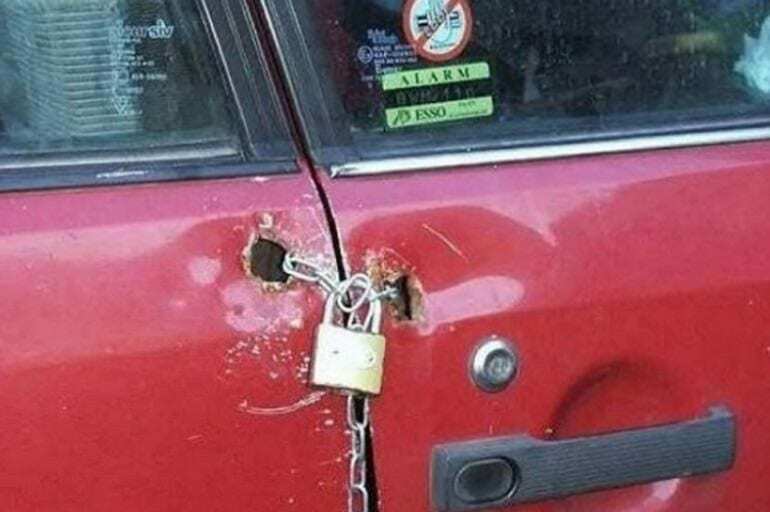 We wonder what is so important in the vehicle this person needed to add an extra layer of security? Although the car window tells us it comes with an alarm, it appears as though this vehicle has been broken into one too many times. There is only one thing to do: take safety into your own hands. Unfortunately, their grand plan might not be as foolproof as they once thought. After all, one set of bolt cutters later and the burglar is in. Car seats can sometimes be uncomfortable, especially if you are sat in them for hours. That, or you pull into your favorite fast food restaurant on the way home only to have yourself a burrito disaster that leaves a huge stain all over your seat. How could you ever explain the mess? Sometimes it’s just easier to replace it as if nothing ever happened. 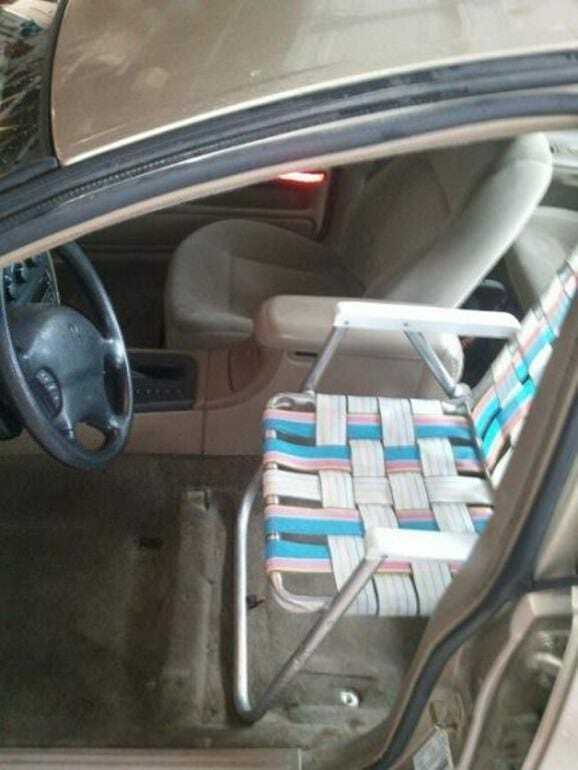 This person had the perfect answer to their dilemma by switching out their seat for this charming replacement. 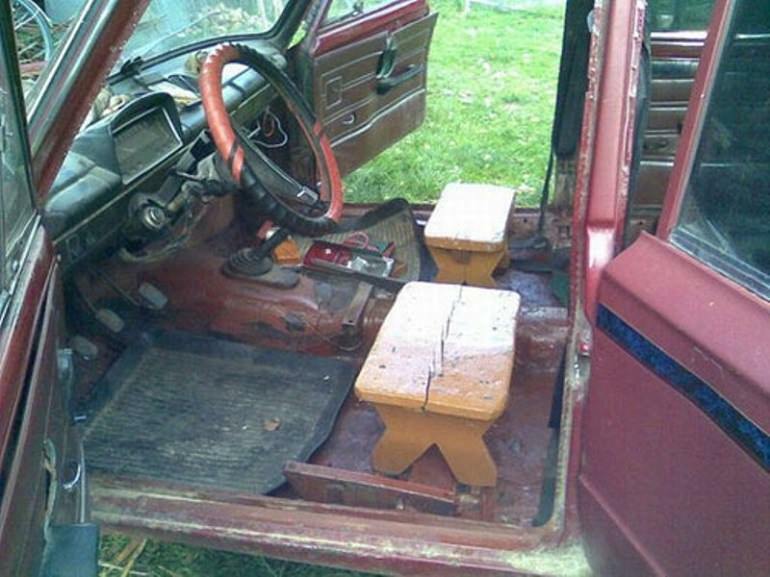 We wonder if their car seat is with the rest of their garden furniture? At a quick glance, this looks like an average car. 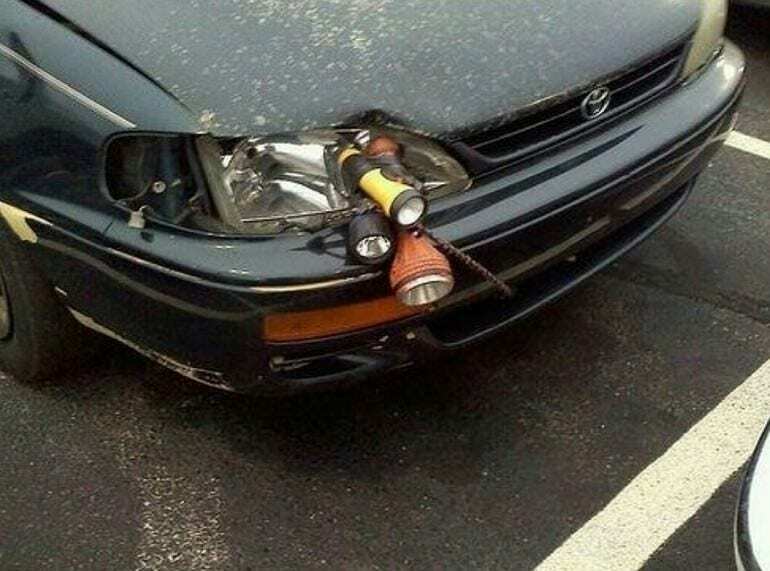 It’s only when you look closer that you may notice their unique headlight solution. We hope they have plenty of batteries if they plan on using flashlights as a long-term option! 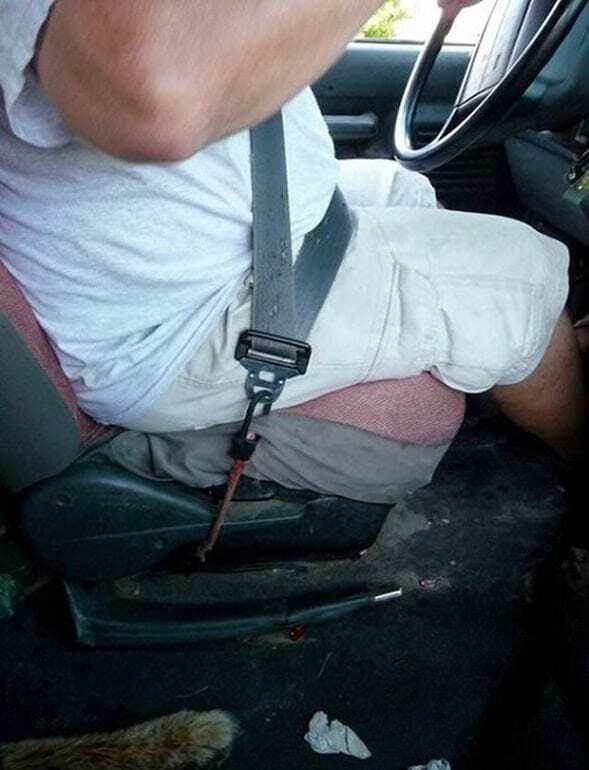 However, the car hack fail doesn’t end there. No, this person has also decided to cover up the accident that caused them to lose their headlight in the first place. 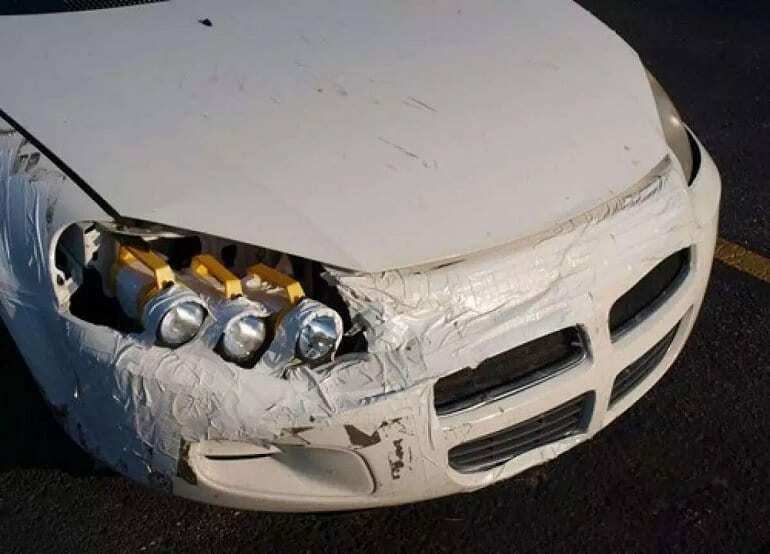 Only rather than getting a paint job, they thought tape would be the perfect replacement. It isn’t. Driving in the rain isn’t everyone’s idea of a good time. However, this driver is having even less of a good time than most others. 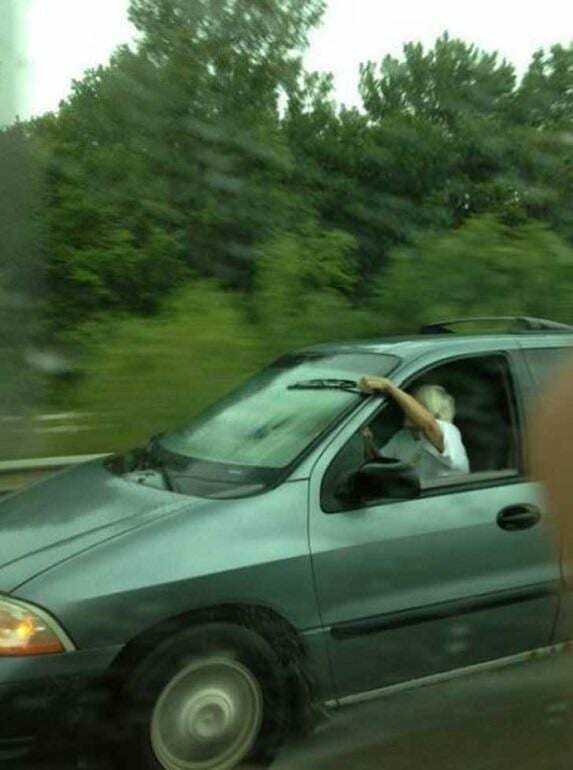 Sure, a broken wiper may seem like a simple issue to live with. That is until water starts pouring out of the sky. We’re just glad to see that the owner has kept the offending wiper as a replacement. Surely if they are willing to get this wet driving with the windows down, they could have just walked instead? 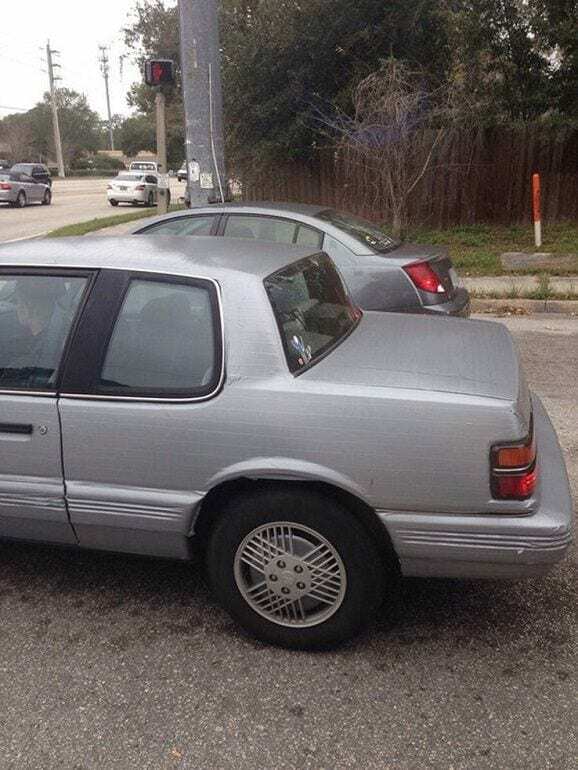 What appears to be a regular silver car is actually much more than it seems. See those lines? They aren’t custom additions. No, this car owner thought that rather than forking out for an expensive paint job they would just cover their car in silver tape. That’s a great idea to save money until it rains. We’re not sure the vehicle would look so great once the tape starts peeling off. Perhaps they should put some money from their tape fund towards fixing this idea? Hands up if you enjoy having a snack in your car? Ok, so it’s not just us. Great. 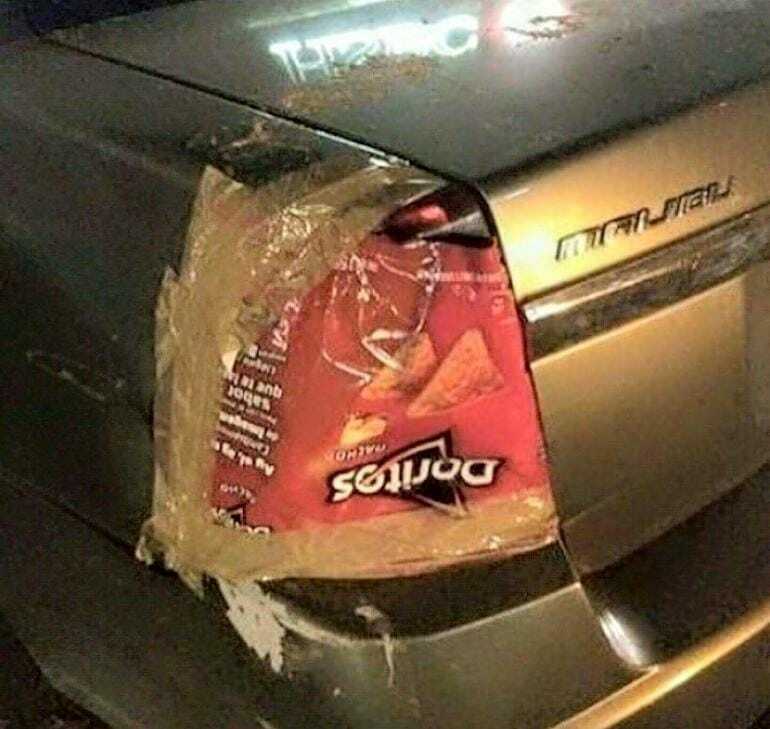 Unfortunately, it looks as though this person looking for a car hack fell into some trouble when trying to find something to cover their broken tail light. The question is: what came first, the hole or the Dorito packet? After all, it can’t be a coincidence they are the same color, can it? That, or they saw the chip bag on the floor and knew it would make the perfect replacement. We will never know. Sometimes our cars feel as though they need a bit of class. Having the same vehicle as everyone else on the road can be dull, and we didn’t come here to blend in. Neither did this car owner. It looks as though they are slowly building a home on wheels or they had no idea how to fit a car window properly. We’re going to guess it’s the second option. Hopefully, they remembered the curtains on the inside to really jazz it up. So you’ve got your next set of wheels and want to find a way to make it your own? No problem. Changing the seats for something more your style is one of the easiest ways to customize any vehicle. Sadly, we’re pretty sure there are still rules that need to be followed when it comes to choosing your seats. Although safety might not be this driver’s primary concern, they still kept the mats to keep the interior nice and clean. No one is an animal. Let’s be honest, CDs are officially on their way out. Vinyls may have stuck around, but now it’s all about downloading and streaming the latest tunes rather than building up a collection of your favorite albums. 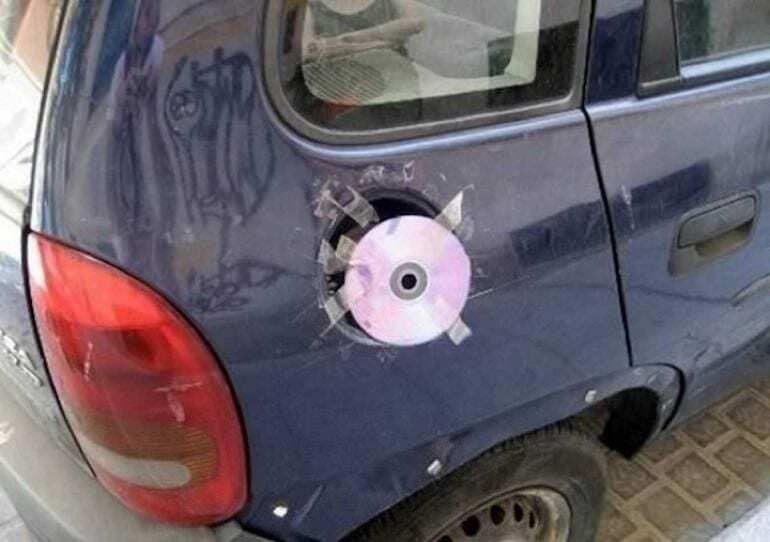 It appears as though this person looking for a car hack found a use for all those old disks they had lying around the house. There is no need to toss them in the trash when they can double up as gas tank covers. No one will ever be able to tell the difference. Many people like to believe they know what’s going on underneath the hood of a car. In reality, we are mostly clueless as to all the intricate details of the engine. So when searching for solutions, it can be easy to find the first thing that fits and hope for the best. 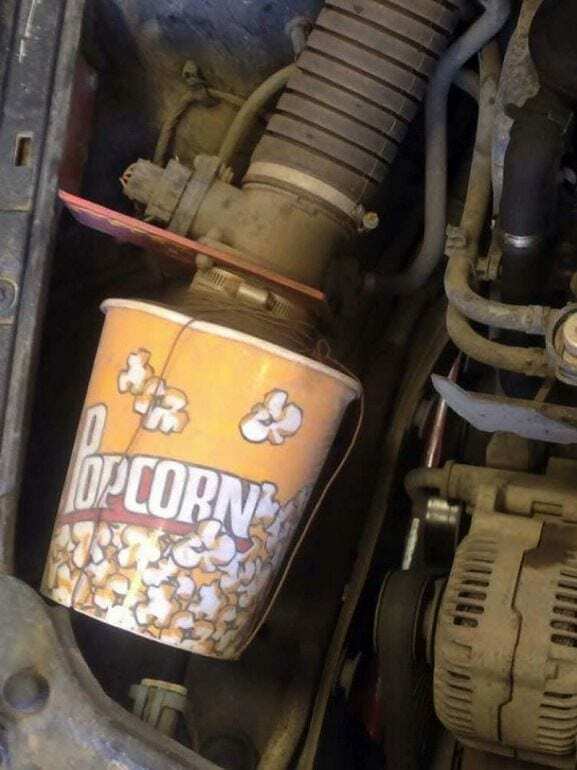 This popcorn bucket may look good and give off a delicious smell whenever the engine heats up, but we’re pretty sure it’s best not to use flammable materials around so much heat. Don’t ask us – we’re not the experts, but judging by this, neither are they. 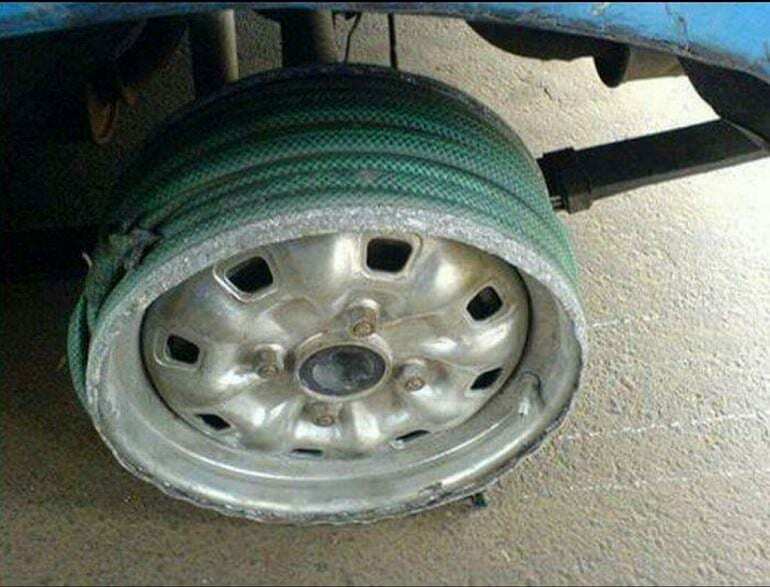 What do a tire and a hosepipe have in common? They are both made out of rubber! So does that mean they can both do the same jobs? Probably not. However, this car hacker was willing to put this to the test when they needed a new tire for their car. It looks as though it’s so far so good on the hose front as there is only a small hole. However, it seems as though the rims have seen better days. Band-aids can be the answer to many issues. Broken a nail? Stick on a band-aid. Got a papercut? Band-aid. Grazed your knee? The list could go on and on. 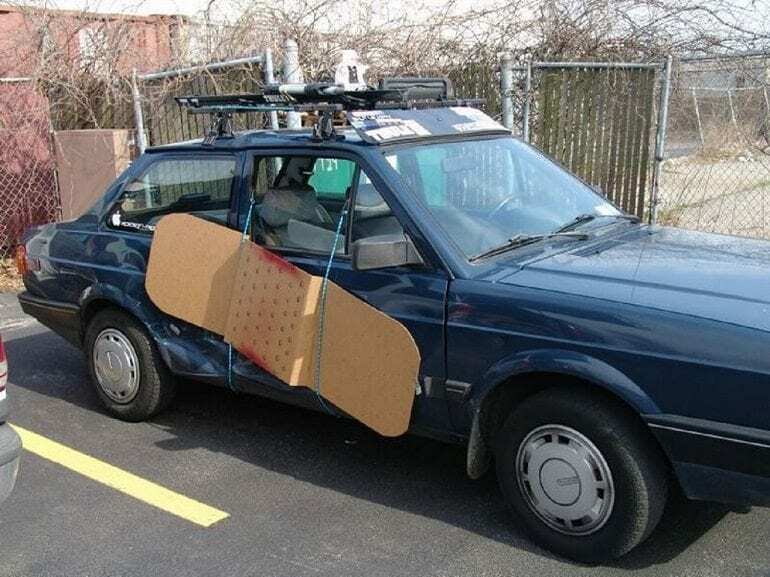 We love the effort that this person has gone to cover up the damage lying beneath their car-sized band-aid, but we’re pretty sure they might have to rip it off one day. Just one quick, swift movement. However, for now, it is out of sight and therefore out of mind. 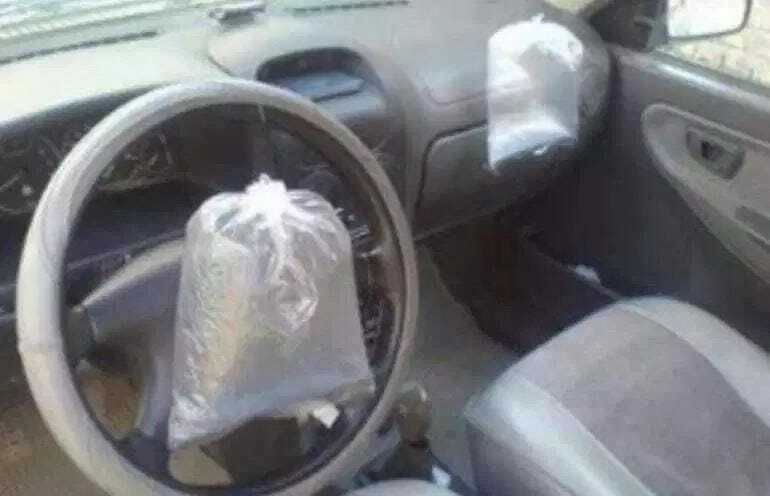 Airbags, bags of air, they must be the same thing, surely? We mean, it’s not like they are there to help keep everyone in the car alive should you be in an accident. No, these are the times in life where we can sit back and save money. 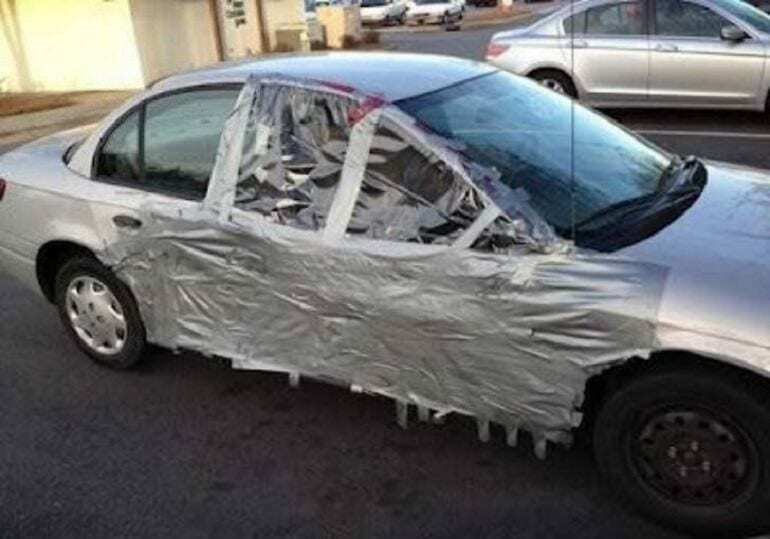 This person was determined to create a funny car hack fail for anyone looking to upgrade the safety system of the car. Sadly, we’re not sure how well their new idea will take off.